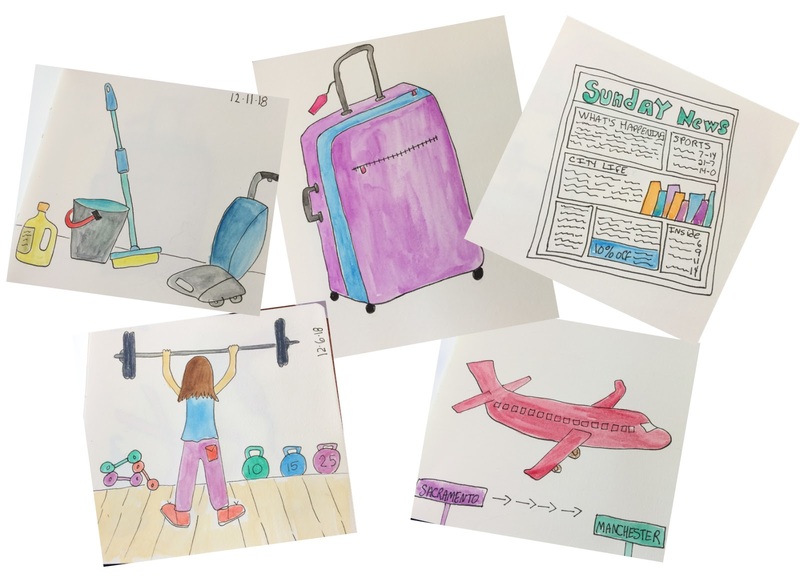 We're only 3 days away from the kick off for The 2019 Sketchbook Challenge re-boot! I am really excited about getting to see all your sketches - I think we are going to have a lot of fun sketching together every day. I'll be posting my sketches on the Sketchbook Challenge instagram page and the facebook page and I'll be using the hashtags #dailydraw2019 #thesketchbookchallenge and #drawingwithsueb so make sure you tag your posts with those hashtags too. You can also post photos of your sketches on the The Sketchbook Challenge facebook page as a reply to any of the posts there if you're not on Instagram (which is free and very easy to use by the way so you might want to consider it). Now I know that the idea of a daily challenge can be daunting and can get overwhelming pretty quickly especially when you miss a day so let me just say this to you: This challenge is supposed to be fun. It's not supposed to add any stress or angst to your life (we've all got enough of that these days) so if you miss a day or two here and there, it's okay. Don't let it derail you from staying with the challenge and continuing with it. Just pick up your pencil and jump back in whenever you can. Now as far as what to sketch that's up to you. I have found that sticking to sketching something from my day - something I did, saw, experienced, ate - whatever is working really well for me. 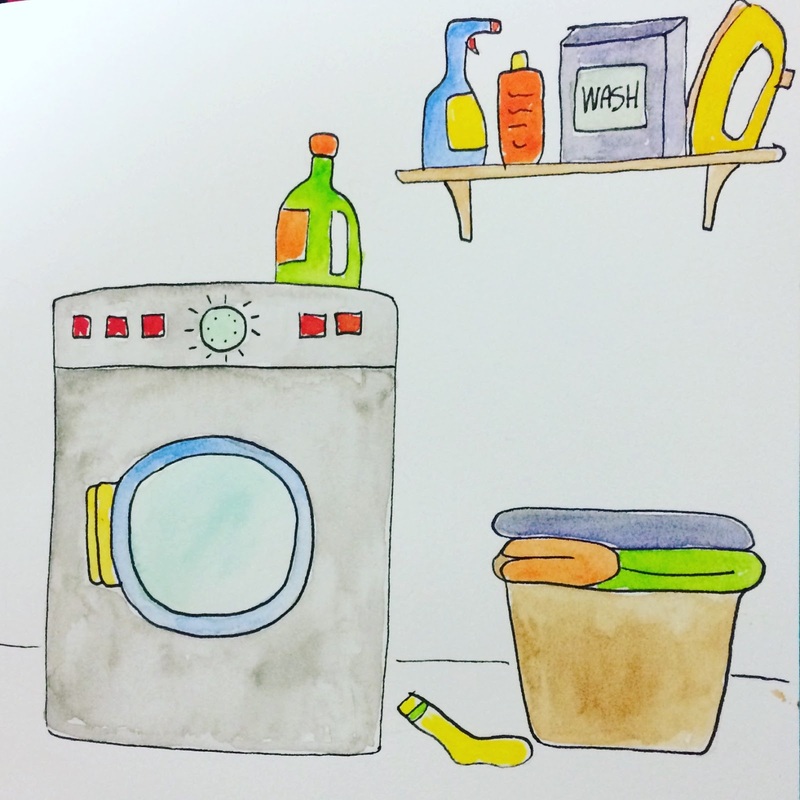 Even something as mundane as doing the laundry can make a fun subject to sketch. For me, this approach keeps the challenge limited in scope which helps keep it from getting overwhelming. 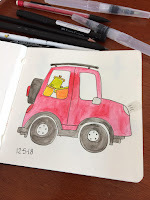 I am using one dedicated sized sketchbook (my favorite 5" square one) and I will only do my daily challenge sketches in this book throughout the year starting a new one each time I run out of pages. Also: don't forget that the giveaway I am hosting is still open for comments so you still have time to get in on it! Click here to get the details! The new Sketchbook Challenge begins in just 9 days! I am really excited about the challenge and based on the number of comments and emails and the spike in traffic to this blog and the facebook page I can see that you all are too. One of my goals for the sketchbook challenge is to keep it approachable and easy to do for everyone and anyone regardless of whether or not you have ever drawn anything or have been sketching for years. 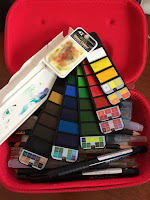 One of the things that I think can help you stick with the challenge is to have a sketching supply kit put together so that whenever you are ready to sit and make a quick drawing you won't have to worry about trying to find your supplies. 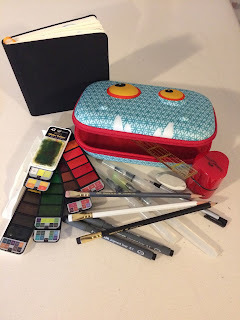 I keep my sketching/coloring kit in one of my zipit beast pencil cases (I have several of these cases folding travel watercolor set, a fewwaterbrushes, blackwing pencils, black waterproof pens, eraser, pencil sharpener and a little 6″ long ruler. That's it, that's all I need to make a sketch in my little 5" square Global Art Materials sketchbook . I absolutely love the size of this sketchbook for this project. The pages are large enough to create a fairly detailed sketch without being so large that the amount of space to fill becomes overwhelming. Perfect for keeping this project simple and stress free! Oh and I also have a piece of paper towel folded up in a small ziplock bag so I can easily clean my water brushes. Why not take a few minutes between now and January 1st to put together a little daily sketching kit? Your kit doesn't have to be a replica of mine because you should work with whatever materials and tools that you like. If watercolors don't appeal then go ahead and use colored pencils, markers, brush pens, crayons, acrylics, pastels etc. Use what you like so that the process of drawing every day feels like a joy and not a chore. Just make sure whatever sketchbook you use has paper that is appropriate for the medium that you are using. Maybe you prefer to use a mechanical pencil instead of a traditional one - great! Go head and use that. Not interested in adding color to your pages - that's okay too. Go ahead and work in black and white - there are no rules here! That's it. It's as simple as that. Okay so I want to get this challenge kicked off with a little "getting started sketchbook kit" giveaway! I am going to give this kit away to one lucky Sketchbook Challenge reader. Here's what's in this kit: a 5" square Global Art Materials sketchbook, a set of 12 double sided colored pencils, a set of 10 Superior Needle drawing pens, 2 blackwing pencils, an eraser, a pencil sharpener, a set of 7 metallic Gelly Roll pens and a pencil/paintbrush. Want a chance to win this pretty awesome little sketchbook kit? All you have to do is leave a comment here on the blog by 12/31/18 and I will pull a name randomly from all the comments and announce the winner on January 1, 2019.
p.s. If you have gotten a head start on the challenge don't forget to tag your photos with the hashtags “drawingwithsueb” and “dailydraw2019” You can also post on the Sketchbook Challenge Facebook page here and don't forget to follow the Sketchbook Challenge Instagram account too! thing that represents something that I did that particular day. This makes it much more manageable and because the size of the paper is small I don’t feel overwhelmed by having to fill it up. There’s just enough room for one large drawing or several small ones. I spend anywhere from 15 – 30 minutes at any one point during the day. 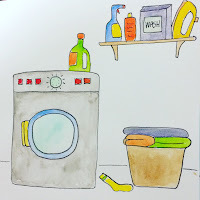 I do a quick pencil sketch, then outline in black waterproof ink and add color with a portable watercolor kit and my water brushes. Sometimes I break up the steps throughout the day. I might have time to do a pencil sketch and outline but will come back to add color later and there have been a couple of times when I didn’t add the color until the next day. represents what I spent some of my time doing that day. I have found that it’s very relaxing and it helps disconnect me from the chaos of the day for a little while. I put together a little sketching/coloring kit in one of my zipit beast pencil cases (I have several of these cases and I love them) so everything I need is portable and easy to grab. Plenty of room to fit my travel watercolors, a few waterbrushes, pencils, black waterproof pens, eraser, pencil sharpener and a little 6″ long ruler. 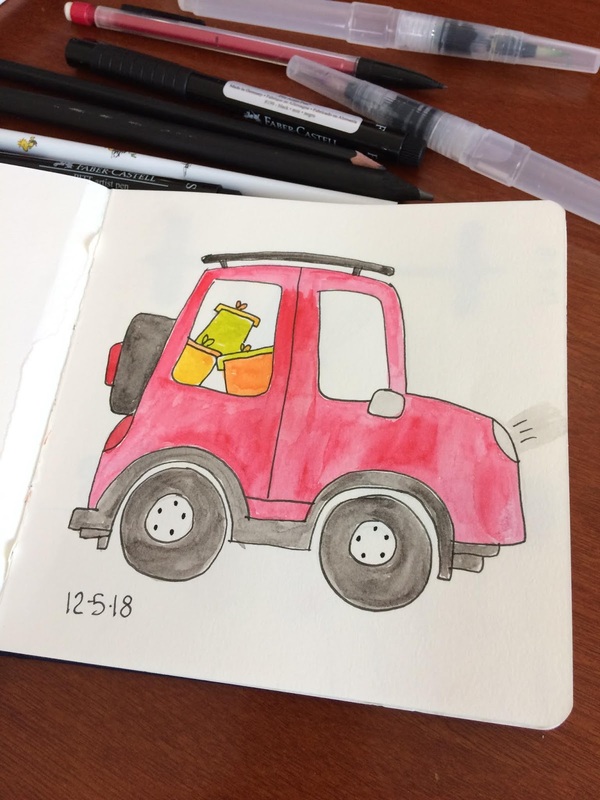 My goal is to continue doing a drawing a day through 2019. 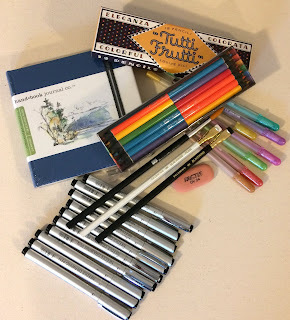 If you’re interested in joining along with me pull together a few supplies of your choice and grab one of those sketchbooks gathering dust on the shelf that is still empty because you couldn’t decide what to draw in it. Start with just one small element from your day. If you want you can also add some text with your drawing and don’t forget to date your pages. Just keep it simple! It’s up to you whether or not you want to share photos of your pages but if you do use the hashtag “drawingwithsueb” or “dailydraw2019” so we can find each others drawings easily. You can also post on the Sketchbook Challenge Facebook page here and there's also a Sketchbook Challenge Instagram account that you can follow now. 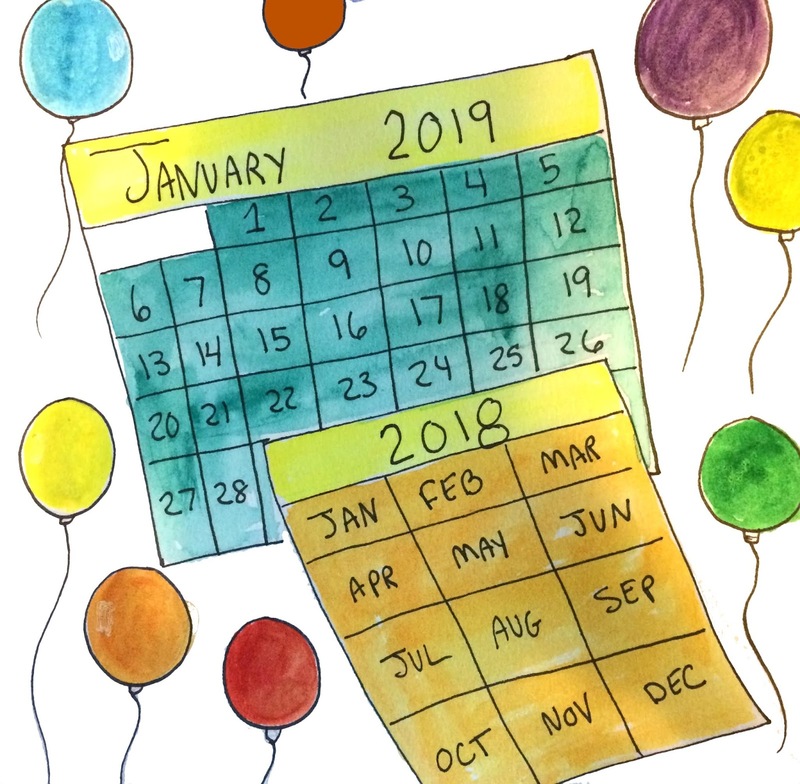 Looking forward to sharing this drawing adventure with you through 2019!